A map of Italy, Sicily, Corsica and Sardinia. 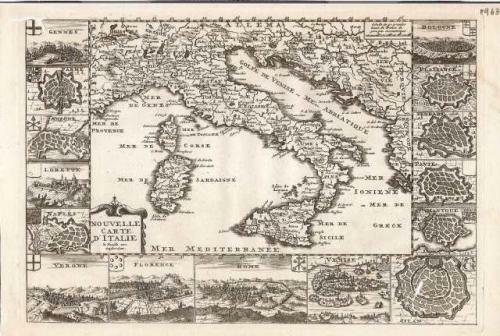 The map is surrounded by 15 vignette views of major fortified towns and cities including Genoa, Parma, Naples, Verona, Florence, Rome, Venice, Milan, Padua, and Bologne. Worm tracks in the upper left (Gennes) and bottom right (Milan). Vignettes with slight loss. Scarce.